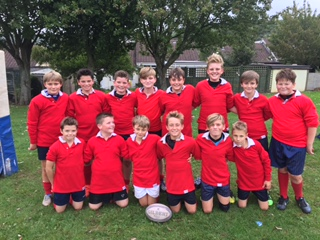 Year 7 had their first rugby match away to Fairland's on Wednesday 28th September 2016. Hugh Sexey's boys had really been looking forward to this fixture. We started the game as the stronger side, playing some good rugby and scoring some early tries thanks to excellent teamwork. As the first half progressed the boys played some great passing rugby and scored 3 more tries. At half time we had a team talk and changes were made because we had some strong players on the bench waiting to come on and play. Hugh Sexey's continued to play well, playing some smart rugby which scored us more points on the board. The game ended with Hugh Sexey's winning 35-0 which is a comfortable win; all credit to Fairlands' boys for not giving up. Well Done boys - a great start to your rugby term. I am a very happy Coach. Squad: Jacob Ayres, Ethan Floyd, Tyler Downie, Sergio Wadey, Oscar Simms Preston, George Nuttycombe, Sam Tucker, Gabriel Baldeggar, Wilf Puddy, James Fowler, Nathan Radford, Stanley Snellgrove, Aidan Scoulding and Dylan Platt.